One year ago, Mike Carter was campaigning against a a 20-year incumbent for a seat on the Franklin County, Virginia, board of supervisors. He won, with a platform that included opposition to the Mountain Valley Pipeline. Now, the first-year supervisor faces a key vote that could test his ability to reconcile campaign statements and personal feelings with the county’s economic interests. As the broader debate over pipelines continues at the national level, local officials — including some who previous took stands against the projects — are also dealing with more tangible, ground-level decisions. 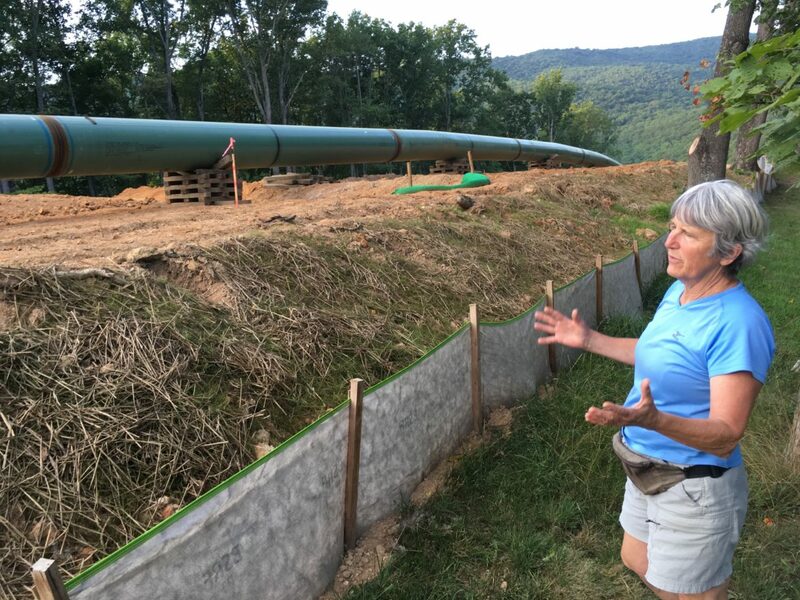 Franklin County is one of two counties along the Mountain Valley Pipeline route in southwestern Virginia that have been asked to approve plans to build gate stations. The hubs would allow access by Roanoke Gas, a utility that services roughly 60,000 customers across the Roanoke Valley and part of Montgomery County. For Carter, a Rocky Mount business owner, opposition to the pipeline stemmed from its use of eminent domain to take property from private landowners, as well as for the fact it has few taps along its 303-mile length. “That tells me up front it’s not for domestic use, it’s for export,” Carter said. He’s skeptical of Roanoke Gas’s proposal to build and operate a gate station at the county’s Summit View Business Park, but that’s got more to do with the details of the project than its larger goal. Initially, Carter said, the utility wanted the county to give it a 2-acre parcel of land. He balked at giving away taxpayer property, as well as at the company’s lack of specificity in its plans. A majority of the board concurred, and that proposal failed. Roanoke Gas’s new plan requires only a special-use permit for a 2.9-acre piece of land at the industrial park. The proposal received a unanimous endorsement from the Franklin County planning commission. Carter seems more open to that idea, but questioned whether the county actually needs natural gas for business attraction in 2018. Montgomery County’s planning commission has also endorsed plans to build a gate station. In both localities, the board of supervisors must vote on the project for it to receive county approval. Both have been loudly opposed by residents and pipeline opponents, and yet the boards look likely to approve both gate stations, in part due to hope that natural gas service may result in more economic development and job creation. “We find that prospects looking at communities throughout Virginia or even the whole U.S. are asking first and foremost, ‘Do you have natural gas?’ All of those projects, we have to say, ‘No we don’t,’ and we get cut out of the process. We tend to lose a lot of prospects that way,” Franklin County Economic Development Director Michael Burnette said in late 2014, soon after plans for the Mountain Valley Pipeline were announced. That’s why the county board of supervisors all but endorsed the pipeline at the time. In the years since then, however, opposition has grown as the pipeline received approval from the Federal Energy Regulatory Commission and construction began, with Carter’s election to the board as a prime example. On the other side of the mountain, in Montgomery County, the gate station is less of an economic imperative. It would, however, reinforce the natural gas supply for Roanoke Gas and potentially extend its reach. A Roanoke Gas official said the gate station would provide extra capacity, reduce local customers’ distance from supply, and potentially result in lower bills for some. The planning commission voted 4-2 to endorse the plan, despite vocal opposition from most of the speakers at its meeting. Supervisor Steve Fijalkowski, who represents the Elliston area where the gate station is planned, first won election to the board in 2017, well after the pipeline had become a local issue. The community is also where a pair of tree sitters have blocked the path of the pipeline since early September. Echoing similar tree sits that took place in the spring, the protestors — a 24-year-old resident of Montgomery County originally from neighboring Pulaski County, and a second, pseudonymous protester going by “Nettle”— have established blockades in trees near the Roanoke River. Fijalkowski said he opposes the pipeline as an abuse of eminent domain that has hurt his constituents — many of whom live on farms that have been in their families for generations — but he is open to the gate station. That same evening, the Fijalkowski and the other supervisors held a public hearing on the project, hearing vociferous opposition from county residents and others who wanted the board to at least delay its consideration of the gate station until the Mountain Valley Pipeline resolves issues surrounding a Clean Water Act permit that was vacated in early October by the 4th U.S. Circuit Court of Appeals. Company officials say they expect to obtain a new permit by early 2019. During the public hearing in Montgomery County, Fijalkowski sparred with another supervisor, Sara Bohn, over the scope of her questions to a Roanoke Gas official about the volume and source of the gas that would come through the gate station. “We’re not here to approve or disapprove of fracking,” Fijalkowski told Bohn. “We’re here to approve a facility to get fracked gas to additional customers,” Bohn responded. The board will decide on the gate station at a future meeting, possibly its next one on October 22. The tiny hamlet of Stoneville is the latest community to pass a resolution opposing a Mountain Valley Pipeline extension.